1. Rub the lamb with a little oil, sprinkle over the oregano and season. Leave to marinate for 30 minutes, or overnight in the fridge. Bring back to room temperature before cooking. 2. Preheat a griddle pan over a medium heat. Sear the meat for 5–6 minutes on each side, then remove from the griddle, drizzle with the honey and leave to rest in a warm place. 3. Meanwhile, make the feta curd. Blend the feta, lemon juice and oil in a blender until smooth. Season with pepper and set aside. 4. Lightly crush the peas, in batches, in a pestle and mortar and transfer to a bowl. If the peas were frozen, press dry with kitchen paper to get rid of excess moisture. Stir in the remaining ingredients; season. Spread the feta curd over serving plates and spoon over some crushed peas. 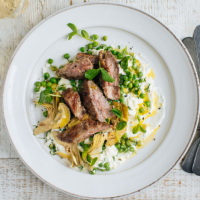 Slice the lamb and divide evenly between the plates, top with the artichokes and sprinkle with the pea shoots. Drizzle with extra virgin olive oil and serve.